Arakawa and Berinchyk make weight! Tomorrow we'll see Japanese warrior Nihito Arakawa (32-6-2, 18) [荒川仁人] battle against heavy handed Ukrainian Denys Berinchyk (10-0, 7) at the Kyiv Palace of Sport. Today, ahead of their bout, the two men took part in their weigh in, and both were well under the 135lb limit. On the scales the Japanese fighter was 134.5lbs, a full 1/2lb under the limit for the WBO International Lightweight title fight. Berinchyk was even lighter, coming in at 134lbs for the bout, a full 1lb under the limit. Related - Arakawa and Berinchyk seek major win in Kyiv! Earlier this month there was a Chinese press conference to announce Can Xu's (16-2, 2) [徐灿] first defence of the WBA "regular" Featherweight title, taking on former WBA "regular" Super Bantamweight champion Shun Kubo (13-1, 9) [久保隼]. Kubo today held a press conference alongside members of the Shinsei gym to announce, and talk about the contest. Kubo revealed that a planned bout in December was cancelled due to double vision and that he had considered retirement at the time though he later had surgery and appears to be fully fit again, have been in the gym for a while since then. The match up will be one of the few where Kubo doesn't have a size advantage of his opponent, with Xu reportedly the same height as Kubo. Masato Yamashita, there as Kubo's promoter, stated the champion "has a hard guard, not a single shot, is a champion who strikes a punch firmly. Kubo wants to keep a sense of distance and strike away and decide the counter" with Kubo himself adding "I think I'm a strong player. I don't mind away, I just do boxing with more feeling than technology. I think that the end will be a game of feelings." As previously reported this bout will take place on May 26th in China, with Kubo looking to become a 2-weight champion and Xu looking to build on his career defining win over Jesus M Rojas in the US. Saka and Noynay make weight! Tomorrow in Japan fight fans will get the chance to see an excellent match up between Japanese puncher Kosuke Saka (18-4, 15) [坂晃典] and Japanese-Filipino boxer Joe Noynay (16-2-1, 5). The two men will be fighting for the currently vacant WBO Asia Pacific Super Featherweight title. Today they took part in their weigh in, and both fighters made the weight with no issues. On the scales Saka, the shorter man best known for his reign as the Japanese Featherweight champion, was 130lbs exactly, coming in dead on the limit. He looked strong and powerful but was made to look much smaller than Noynay. The visitor was slightly lighter, at around 129.7lbs and looked in good shape himself. 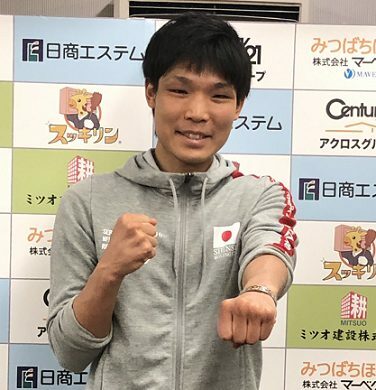 He seems to the under-dog, but is a very live visitor, and he will be well remembered by Japanese fans who will recall him giving Reiya Abe a really competitive bout not too long ago. For those wanting to watch this it will be made available, on demand, on Boxing Raise and also involved on this card will be Tetsuya Hisada (33-9-2, 19) [久田 哲也], who is expected to get a world title fight later in the year. 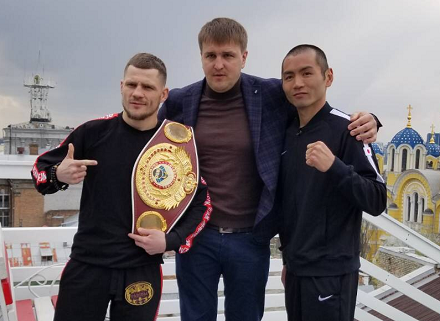 A few days ago we reported that unbeaten Kazakh Heavyweight Zhan Kossobutskiy (9-0, 8) [Жан Кособуцкий] would be back in the ring in Minsk on April 24th to take on Kazakh born German Eugen Buchmueller (15-4, 12). It's now transpired that Buchmueller has pulled out of the bout, citing an injury, which forced Kossobutskiy and his team to seem a replacement opponent. The replacement that has been secured is Venezuelan Cruiserweight Williams Ocando (20-7, 16). On paper this does actually look like an improvement, with Ocando having more experience, being just 30 years old and and having mixed with decent fighters, going 5 rounds round with Olympic champion Evgeny Tischenko back in August. However given he's had less than a week to prepare, is a blown up Cruiserweight and has been stopped in 6 of his 7 losses it's hard to imagine him him being much competition for the Kazakh.